This article was originally published by Northern California Public Media and is republished here with permission. That harrowing time led Lincoln-Cook’s her family to action. They clear the land around their homes every year, and sprinklers are placed to wet the ground in case of another fire. It’s also made her cognizant of what cultural burn managers are working to accomplish. “That’s why we’re hopeful of more controlled fires rather than disaster fires of that sort because those are pretty hard to take when they’re taking lives and homes and stuff like that,” she says. But could these fires have been, if not prevented, at least rendered less destructive? 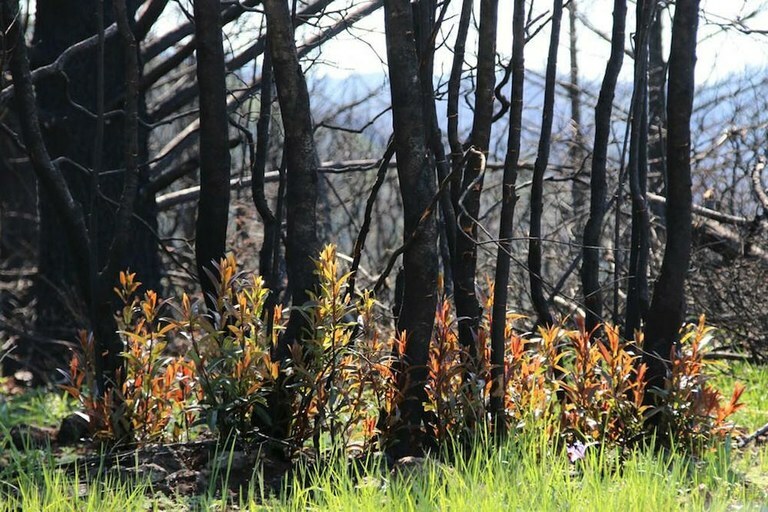 From fire comes new plant life at Pepperwood Preserve. Many Indigenous peoples in California say yes. They say their traditions once protected these lands and could do so again — if they’re given the opportunity. We visited several Northern California tribal communities to learn more. The first stop: Pepperwood Preserve, a 3,200-acre facility just east of Santa Rosa. It contains oak groves, mixed conifer forests and grasslands, and is home to many endemic species. It’s a beautiful drive despite the burned-out sites we see on our way up to the preserve. This hilly region is also home to Indigenous peoples, including the Pomo and Wappo cultures. Here, we meet Clint McKay, one of several Indigenous Californians who are using fire to fight fire. McKay is the cultural consultant and Native American advisory committee chair at Pepperwood Preserve. McKay is a citizen of the Dry Creek Band of Pomo and has Wappo heritage. He is also a noted cultural practitioner, particularly in living with the land — and carefully setting fires to cleanse the land. “(Pepperwood) asked us to provide some insight to the native way of working with the land,” says McKay. He adds, “Land management means to me that you’re controlling something. I don’t believe we have the ability or the right to control nature, so we work with it.” McKay shows us where the fire came through an area that was scheduled for a controlled burn. It was supposed to clear the area of the “duff,” as McKay calls the accumulation of dead plants, weeds and unwanted trees that choked the area, but the fire ripped through here and basically did its job. He points out plants meant for medicinal purposes and food. “Soaproot is used for soap and brushes,” he says. There’s also miner’s lettuce, wild potatoes and other useful plants growing out of the ashes. Cultural burning creates the perfect conditions to grow the basket making materials Pomo people need to keep their tradition alive, McKay says. This philosophy became embedded in the environmental movement, and although it’s slowly being replaced with a more Indigenous, holistic approach, it’s caused no end of issues for Native cultural practitioners. The Pepperwood community is no exception. “It’s taken a long time for us at Pepperwood to understand that things are deeper than traditional environmentalism,” Ben Benson, cultural resources coordinator at Pepperwood, says. Frank Lake shows off huckleberry in a burned area. “I gave a talk out here and tell people that it’s like we’ve pushed a reset button on the land,” McKay says. “You can see here we’ve seen what seven generation of neglect can do.” McKay is referring to the length of time that fire suppression has been official government policy — roughly equating to seven generations of Native peoples’ tenure in California. Others, like the California Chaparral Institute, believe that prescribed burns can do more harm than good. They point to what they call “fire management practices on incomplete records from prehistory” as a rationale for not heeding Native peoples’ calls to burn. The institute also says that Native people claim that their burning will prevent fires; however, the Native practitioners we spoke with all refute that claim. What they told us is that cultural burning will greatly mitigate the severity of wildfires and prevent killing off beneficial microbial life that lives in the top layers of soil, or “sterilizing” the soil. The U.S. Forest Service is another player which has come to understand that forests need fire to remain healthy. We visited with one Forest Service ecologist who’s demonstrating that. Some six hours north of Santa Rosa lie the Trinity Alps, some of the most beautiful — and treacherous — peaks in the West. Narrow valleys are walled by nearly vertical slopes, carved by the mighty Klamath River and its tributaries. The Hupa, Karuk, Yurok, Wintu and other northwestern California Native peoples call this region home. Narrow roads wind through the valleys, providing the only lifeline out of harm’s way in case of fire or other natural disaster. We’re driving north on State Route 96 on a chilly wet spring day, weaving around construction zones, delivery trucks and local residents to visit with Frank Lake, an ecologist for the Forest Service. Lake is stationed at Six Rivers National Forest in the small town of Orleans. Lake is a Karuk descendent, who grew up in Northwest California. The Karuk also have traditionally used fire to maintain their lands and create room for important food and medicinal plants to grow. Lake knows these mountains and valleys intimately. Lake uses this accumulated knowledge of more than 10,000 years of living and thriving here in his work with the Forest Service. That traditional ecological knowledge, or TEK, includes using fire to increase biodiversity and support the entire ecology. “I came to work for the Hoopa Tribe for a while to be culturally closer to this area which is just to the south, about 20 miles from Orleans,” Lake says. He sports a crocheted cap with a geometric basketry pattern under his regulation hard hat. He’s also wearing field gear and heavy boots. His office is cluttered with maps, printouts, books and various other tools of the biologist’s trade. Lake takes us to a burn site outside of town to show us where he and his crew conducted a demonstration burn in late September 2016. There’s open space between the tanoaks and a few other larger trees, giving food and medicinal plants room to breathe — and grow. “This is a mixed forest type,” Lake explained. “It has Douglas fir, tanoak and madrone.” He points out healthy huckleberry bushes and other shrubs such as thimbleberry and blackcap raspberries. Across the road, though, lies an overgrown, unwalkable thicket. Just a few flowers dust the huckleberry bushes, as opposed to the white blossoms with their tasty promise covering the bushes in the burn area. “We’re going to be looking at the recovery of the sites from the ecological and cultural perspectives,” says Lake as he points out the regrowth from the burn. Other tribes in the Trinity Alps echo Lake’s sentiment. Margo Robbins and her nephew Rick O’Rourke of the Yurok Tribe meet us in the nearby town of Weitchpec. Robbins is the co-leader of the Indigenous People’s Burn Network, which aims to revitalize cultural burns, or as McKay says, “burn off the duff,” in Native communities, at the same time revitalizing culture. They’re restoring the use of fire in ceremonies, and training tribal members how to safely conduct cultural controlled burns. “For thousands of years, Native people used fire to manage the lands,” she says. “But when the Europeans came, the park-like countryside that they saw they thought was natural that way.” But the new settlers didn’t understand how fire was used to care for the land, and Robbins says they were fearful — even to the point of shooting or, later, jailing Indians who set fires. Margo Robbins and Rick O’Rourke. But with the advent of prolonged drought, blights like Sudden Oak Death Syndrome and bark beetle infestations, huge wildfires and a changing climate, that’s all changing. Tribal members now burn in culturally important sites, and places where animals can graze, Robbins says. They’re restoring prairies to provide habitat for deer, woodpeckers and other species that had grown scarce. Meanwhile, other Native people are developing protocols to deal with the aftermath of fires. One such program is Follow the Smoke, an initiative of the California Indian Basketweavers’ Association. We met Alice Lincoln-Cook, CIBA’s vice president, at her business in Klamath, along the Northern California coast. The Book Nook is a cozy space. There’s an art gallery in front where Lincoln-Cook makes traditional California Native jewelry for sale and sells other Native people’s work. The bookstore is in back. Here, shelves are stuffed with all manners of books for sale or to give away if the shopper has no money — a frequent occurrence in a town with twice the unemployment and an average household income that’s half of the rest of California. The center of the room sports a table for basketweaving classes or, lately, a girls’ youth group that meets here. Lincoln-Cook, Karuk, says that Follow the Smoke’s goal is to develop relationships with the National Park Service, California State Parks and the Bureau of Land Management so Native people can gather materials after a fire has passed through. 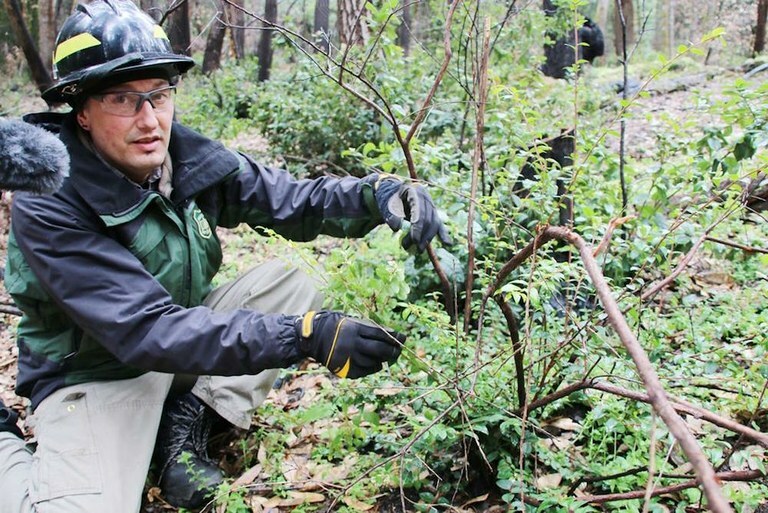 “If there are natural burns, we can help them by going out there and collecting and helping them clean some of those areas and then be able to process it for (our use),” says Lincoln-Cook. “If there are trees that have fallen down, we can go out there and help process the tree,” and clean up the land. “We look at areas where we used to pick hazel sticks, because those come back stronger and they’re better materials for first to work with,” Lincoln-Cook says. At Pepperwood, the land is recovering. Oak tree seedlings are beginning to take root where they couldn’t before because of the poison oak, weeds and bushes that had taken over. It becomes apparent that the work of Indigenous fire practitioners is far from over. There is still resistance to Native land oversight and practices. But Indigenous people like Clint McKay are hopeful the movement back to Indigenous management protocols will spread. And he’s not doing it just for food and medicine — he’s doing it to ensure that Pomo and Wappo basketmaking can continue. 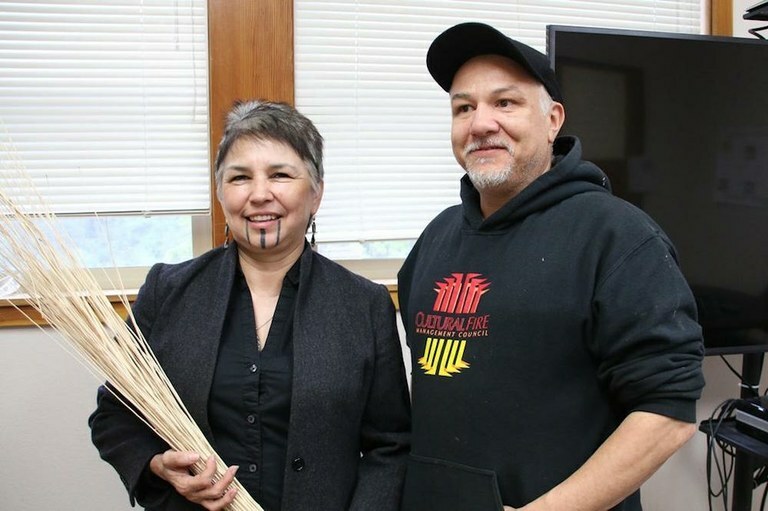 The nephew of famed Pomo basketweaver Mabel McKay, Clint McKay also understands that his work to restore fire to the land also restores sedge, redbud, willow and many other tools of the basketweaver’s trade is also preserving this world-class art form for generations to come. Note: This story was adapted from a podcast. Listen to it here.